Ransom Eli Olds, Inventor, Automater: Darn, Did I Give That One Away? Some names speak greatness. Ransom Eli Olds is a doozy. Let’s take stock here. His father, Pliny Fiske Olds married Sarah Whipple and great things happened. In 1889 Ransom married Metta Ursula Woodard. Off to a rolling start. By 1894 Ransom claims to have built his first steam car and in 1896 he followed up with his first gasoline powered automobile. Olds Pirate Racing Car driven by the man himself on a Florida beach. He could have said, “Avast there matey. Get out of me way or I’ll run ye over.” But he didn’t. He left them in his dust. Ransom invented the modern day assembly line. I know, I thought that was a Ford invention, too. Ford borrowed the idea. Watch out trivia night people, we’re just warming up. He formed the Olds Motor Vehicle Company in Lansing, Michigan in 1897. Needing an infusion of cash, the company was purchased by lumber magnate, Samuel L. Smith, love that alliteration and balance. It rolls off the tongue. Smith became President. 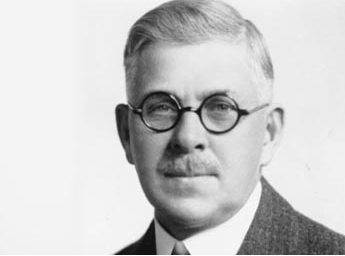 He renamed the company Olds Motor Works and Ransom Olds became Vice President. By 1901, Olds built eleven prototype vehicles, which included models with electricity, gas and steam. He was the only American automotive pioneer to manufacture and sell at least one of each power type. While they settled for 750, Olds is remembered for his audacity. The Dash Curve became the first low-priced, mass-produced American automobile. Yep, I thought that was Ford, too. But wait there’s more, because cash could be an issue, in 1906 he organized two banks, Lansing National Bank and Michigan National Bank. When Sam Smith’s son, Fred, came into the business. Fred’s recurrent clashes with Olds caused Fred to remove Olds from the company. So Ransom took his initials and ideas and formed REO Motor Car Company. Leading to the creation of the REO Speed Wagon. A vehicle, which inspired a band to take it’s name. In the meantime, Ransom built a mansion. In the house he installed a technical innovation: a turntable, so he would never have to drive his car in reverse from the garage. 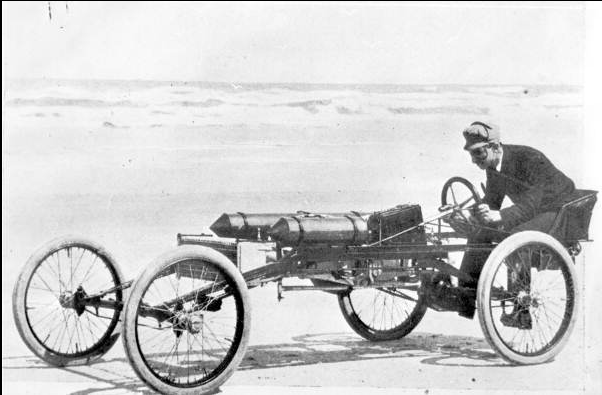 Not satisfied with just inventing cars, in 1913 he purchased over 37,000 acre of land in the northern part of Tampa Bay in Florida. He developed the land, which is now the city of Oldsmar. He also financed the building of the Olds Tower, completed in 1931. It remains the tallest building in Lansing but renamed the Boji Tower. Never fear funny names fans, times have changed, but funny names remained. General Motors purchased the Olds Motor Company from the Smith family in 1908 and manufactured Oldsmobiles until the lines retirement in 2004. That’s 96-years “Olds”. 23 Responses to Ransom Eli Olds, Inventor, Automater: Darn, Did I Give That One Away? So that’s why it’s an “Old”smobile. Well, I’ll be hornschwaggled. The father being Pliny Fiske Olds makes him, in relation to Ransom, Pliny the elder olds . . . I wonder if grandma and grandpa Olds had Roman antiquity in mind? I’m not an inventor or anything, but it seems to me like he’s on the wrong side of those jet engines on that beach racer. Good name, coming from great named stock. He was fated for glory. Son of Olds and Whipple. I am at least as hornschwaggled as Diddz. Gotta love that turn of the century gumption displayed by ol’ Ransom. I think Dave was driving one of his old beasts at one point. A ’98 88, as they call it. I can see Dave cruisin’ in a ’98 88. And ol’ Ransom did have gumption for sure. Pliny Fiske! This is why I love love love love love names! Something else I love – learning that Olds had models that used electric and steam! Electric seems to be doing well thse days… 100 years later or so. But I’m still waiting for steam to make a comeback! C’mon steam-powered vehicles! Actually now that I think about it… considering our drought in California, it’d be super awesome to have out-of-state steam-powered vehicles. Rather than clouds of smog over places like Los Angeles, we could have clouds of…well, clouds… over the state instead! Steam power FTW! Now that would be something to have actual clouds over LA. It might even rain. Doesn’t it make you wonder what fuel they would use today to generate the steam? Would it be an electric hybrid? I’ll take steam powered Teslas for $200, Alex. . . I really like that to be a Jeopardy category someday soon! Arto – I really hope this REO Speed Wagon trivia comes up during a trivia night soon! I also remember back in 2007 or so, when foreclosures were leading to a lot of bank REO (Real Estate Owned), REO Speedwagon had a resurgence of sorts, playing lots of concerts at real estate conferences! Now that’s some good trivia, Dave. Can you imagine someone named Ransom nowadays? That word does not have positive connotations! But would all the first graders be rhyming it with handsome? fantastic family of names, one more odd than the next. my highlight/takeaway from this whole thing is the origin of reo speed wagon, the band’s name. wow. REO Speed Wagon, the band, showed great imagination naming themselves after a car. But did it make them more popular in Detroit? If I start a band, I’m going to call it FQW Dawdlecart. I’m sure the Dawdlecart will be electric. . . This post, and the comments that go with it, are the most entertaining part of my day. Bravo, all. This month’s contribution to the Blog of Funny Names. Sorry I’m late in responding to comments. I’ve been on the road. Safe travels everyone.